I have spent weeks designing our homeschool group’s yearbook and it’s looking beautiful. I love seeing all of our memories laid out from the past year. 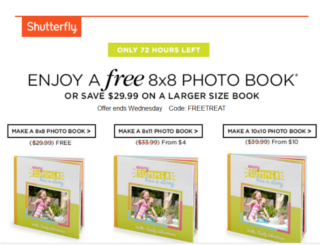 You can do the same with a free photo book from Shutterfly! Use code FREETREAT to get a free 8X8 book. Just pay shipping. Or, use that code to upgrade and get $29.99 off a larger size book. Expired: Up to 25% off at Groupon!